Floods can happen anywhere it rains. Prepare your home and family for a flood by stocking supplies and having an emergency kit at the ready. As a result, virtually everyone should think about flood safety in the home, and prepare for now. Just in case the worst case scenario comes to pass. Even if your community hasn't experienced rising waters in the past, that's no guarantee disaster won't come calling in your neighborhood in the future. These 5 flood safety tips will help you to protect yourself, your family, and your finances before the waters begin to rise and danger is imminent. Take time now to make a list of the things you need or want to take with you if you have to leave your home quickly. 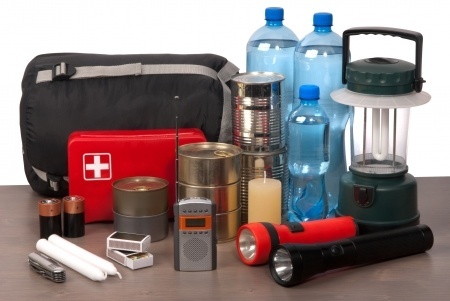 Store the basic emergency supplies in a "Go Bag" or other container. Make sure to include life preservers with your disaster kit. Stockpile emergency building materials including plywood, plastic sheeting, lumber nails, a hammer and saw, a pry bar and shovel. Stack sacks of sand or a sandbag alternative hydrabarrier to prevent or absorb water along vulnerable entry points. Yes, your finances. Cleaning up a water damaged home can set you back thousands of dollars. It simply makes sense to be prepared by having an insurance policy in place. If the latter, you can always obtain insurance through your local insurance agent. Be aware that there is a 30-day waiting period before the insurance goes into effect - so don't wait for that rainy day. Watches, warnings, and evacuation notices are science-based predictions that are intended to provide adequate time for evacuation. Those who wait for actual confirmation of catastrophic levels may be trapped by flooding or traffic. Flooding is possible. You should leave or be prepared to move to higher ground immediately upon short notice. Tune in to NOAA Weather Radio, commercial radio, or television for more information. Flash flooding is possible. Be prepared to move to higher ground; list to NOAA Weather Radio, commercial radio, or television for more information. Waters are rising or will rise soon; if advised to evacuate, do so immediately. If a flood warning is sounded, a flood is imminent. Turn on the radio or TV for weather update and evacuation routes. Grab your disaster kit, collect your valuables in large plastic bags, and get out of Dodge. Or where ever you're at.